The family-run Esmeralda Hotel Kremasti is a family friendly 3-star boutique hotel located about 15 minutes’ walk from the pretty shingle beach in Kremasti and 5 minutes’ from the bustling town. The hotel opens its doors to guests from May 1 to October 31 every year, this seasonal hotel boasts of a freshwater pool, a lovely bar and a restaurant. The hotel offers an affordable choice of accommodation with a friendly environment and high quality services in the sunny resort of Kremasti. Rooms here blend a traditional Rhodes character with modern amenities like a furnished kitchenette, satellite TV and fridge. The studios and apartments come with balcony or terrace providing amazing views of the beach and surroundings. Esmeralda Hotel Kremasti has a bus stop close by so getting public transport to other destinations in the island is easy. The historical Rhodes Town and Rhodes airport can be reached within a 15-minute drive. An array of restaurants, bars and shops close to the hotel. The Kremasti town has pharmacy and medical center, taxi station, bank and cash machines (ATM), shops and supermarkets. Immaculate, well-furnished guest rooms here blend traditional Rhodes character with modern amenities like furnished kitchenette, satellite TV and fridge. Air-conditioning and safe can be ordered by paying extra. The non-smoking studios and apartments come with balcony or terrace providing amazing views of the beach and surroundings. Please note that rooms do not have access for gusts with special needs. Infants up to two years can share the parent’s room and an extra cot can be provided. There is a room service. 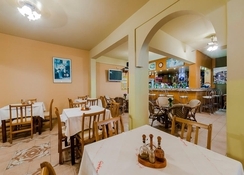 Guests at Esmeralda Hotel Kremasti can enjoy breakfast and dinner buffet, served at the hotel’s restaurant. The restaurant also serves vegetarian meals and children’s menus. For drinks and snacks the place to go is the hotel’s poolside bar. Early breakfast service is available upon request as is breakfast in room. The hotel can arrange breakfast baskets, lunch boxes and dinner boxes upon request. Esmeralda Hotel Kremasti has a swimming pool and kids’ pool and terrace where guests can soak up the fun. Relaxing massage services are available. Tiny tots can have fun with books, DVDs, music for children and board games/puzzles. The hotel has facilities for Darts, Bike Rentals and Billiards. The hotel can arrange diving, hiking and horse riding. 16-hours reception Designated Smoking Area Air conditioning (Additional charge) Soundproof rooms Family rooms Non Smoking Rooms Outdoors Sit back and relax Outdoor furniture Sun terrace Terrace garden Shared Lounge/TV Area Library Swimming Pool Full body massage Hand massage Head massage Couples' Massage Fitness classes Multilingual staff Back massage Sun umbrellas Sun loungers or beach chairs Shallow end pool bar Outdoor pool Outdoor pool (seasonal) Massage (Additional charge) Activities Horse riding (Additional charge) Diving (Additional charge) Hiking (Additional charge) Darts (Additional charge) Billiards (Additional charge) On-site coffee house Chocolate or cookies (Additional charge) Fruits (Additional charge) Bottle of water (additional charges) Wine/champagne (Additional charge) Kid meals (Additional charge) Special diet menus (on request) Snack bar Bar Breakfast in the room Packed lunches Room service Restaurant Fax/photocopying Business Facilities Ironing service Daily maid service Cleaning services Board games/puzzles Books, DVDs, music for children Entertainment and family services Express check in/check out Safety deposit box (additional charge) Tour desk Luggage storage Lockers Tickets to attractions or shows (Additional charge) Reception services Bicycle rental (additional charge) car hire Shuttle service Shuttle service (additional charge) Secured parking Free! WiFi is available in public areas and is free of charge Free! Free public parking is possible at a location nearby (reservation is not needed).